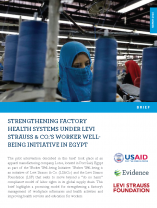 The pilot intervention described in this brief took place at an apparel manufacturing company, Lotus, located in Port Said, Egypt as part of the Worker Well-being Initiative. Worker Well-being is an initiative of Levi Strauss & Co. (LS&Co.) and the Levi Strauss Foundation (LSF) that seeks to move beyond a “do no harm” compliance model of labor rights in its global supply chain. This brief highlights a promising model for strengthening a factory’s management of workplace infirmaries and health activities and improving health services and education for workers.